It's my birthday on Friday. I know it seems a little bit sad to bake your own birthday cake, but I had to make this cake. I couldn't get it out of my head all week. 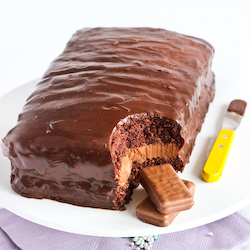 It's 6 layers of fluffy chocolate sponge cake sandwiched between thick layers of icing that tastes like chocolate mousse. When I was around 11-14 years old, every week my parents and I and would visit my favourite shopping centre in KL at the time (1 Utama) and my Mum would always buy me a slice of this layered chocolate cake from this bakery (which I can't remember the name of for the life of me). It was glorious. 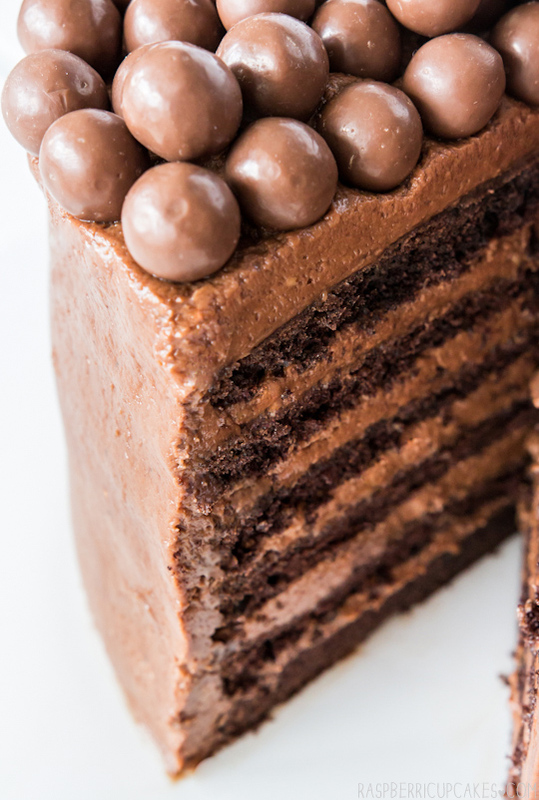 Thin layers of moist, light cake with a milk chocolate mousse icing. Equal ratios of cake to icing. This week I suddenly remembered this weekly ritual of my past and I couldn't stop thinking about eating a slice of that cake. So I made it. And I ate it. IT WAS GLORIOUS. I might have gone a little overboard by making it 6 layers high, but I like my cakes sky high. I used a chocolate mousse icing recipe from the food dept. (if you aren't already following them, you should be) which looked pretty close to the icing I remembered from the magical cake of my childhood. To be honest I was too impatient to eat the thing to spend a long time making the icing smooth or getting a great shot of the cake. It was for meeee. 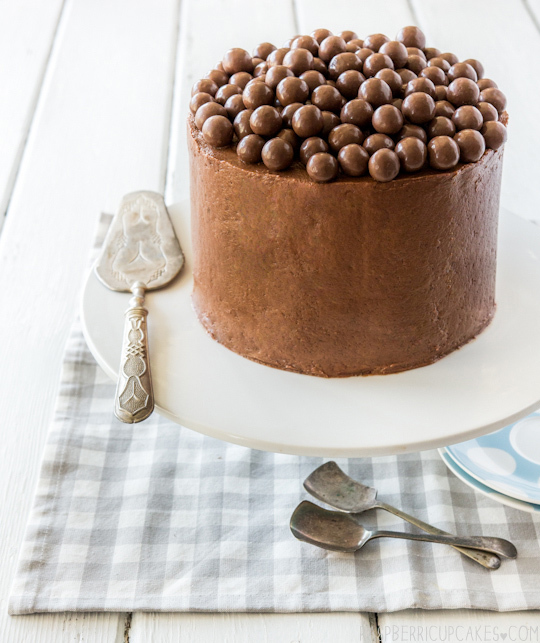 I topped it with a giant sized pack of Maltesers, to give it some crunch on top and because I love me some Maltesers. That first slice tasted so good. The sponge cake was the perfect cake to use with this icing, so light and soft and the whole combination wasn't heavy. It was exactly what I was looking for. I did learn that eating this cake straight out of the fridge is not a good idea. All the butter in the recipe hardens and makes it quite dry when it's cold. You definitely need to let it come right back to room temperature before eating it, as recommended by the original recipe. I even reduced the amount of butter in the icing to make it a bit softer but feel free to use the amounts in the original recipe. I still think I could tweak this recipe to improve it, maybe brush some liquor on the sponge before layering it to make sure it stays moist, or play around with a different chocolate mousse icing recipe. But I'm pretty happy with it as is. Note: Feel free to substitute with your own chocolate cake recipe, as this recipe is very delicate to handle. This cake is not recommended for those inexperienced with layered cakes. Grease well and line two 18cm (7inch) round cake tins with baking paper (if you use a larger tin (like a 20cm/8inch) you will end up with thinner cakes so you can probably only get about 4 layers). Preheat oven to 180°C (350°F). 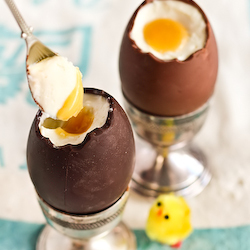 Whisk eggs and sugar in an electric mixer until thick and pale (at least 5-6 minutes, go nuts and don't underwhip). Sift over cornflour, cocoa, flour, cream of tartar and bicarb soda, fold in with spatula and make sure to get rid of any pockets of dry ingredients. Fold in butter, split equally between prepared tins. Bake in centre of oven until the centre of the cake springs back when lightly pressed (20-30 minutes). Turn onto baking paper covered wire rack and cool completely. (Can be baked the day before assembly and stored in an airtight container.) Use a long sharp knife to carefully cut each cake into 3 even layers, take care as the cake is delicate. Remove cream from fridge about 30 mins before starting. Place butter in a large mixing bowl and beat on high with an electric mixer until smooth and fluffy. Add cooled chocolate and beat until smooth. In a separate bowl, whisk cream and sugar until it just reaches soft peaks. Take cake not to overmix. Carefully fold cream mixture into chocolate mixture until combined. To assemble, place first layer of cake on your cake plate or stand, cover with icing and smooth with an offset spatula. Repeat with remaining cake layers and more icing. Crumb coat and cover entire cake with icing. 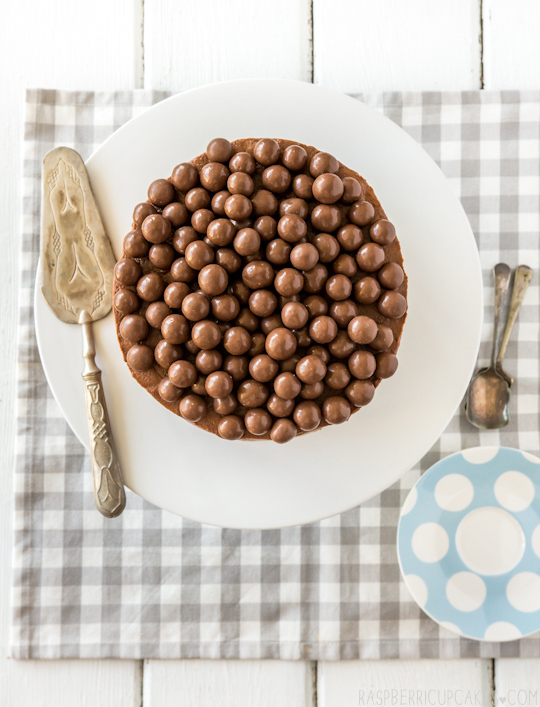 Top with maltesers or another of your favourite chocolates. Can be served immediately (if in hot weather and the icing is very soft you can refrigerate it quickly to firm up the icing a bit but don't let it harden). Can be stored in the fridge overnight in an airtight container, make sure you return to room temp before serving or icing will be too hard (this may take a while, I had to warm my cake slightly in the microwave). I would want this cake for my birthday too! My birthday is this week, and I have been trying to think what kind of cake I wanted, I kept thinking chocolate mousse.. but thats not cake-able! That looks insane. Insanely good! Definitely have to make it even though my birthday just passed! I always bake my own cakes too, it's not weird at all :) Happy early birthday! Happy Birthday Steph! It's my birthday too and I am also making my own cake, like I did the past 5 years. I love the sound of that chocolate mousse icing. A hint to prevent the cream mix curdling, warm a small portion of your cream then add it to the chocolate before adding it to the whipped cream. Oh wow. I can't blame you for making your own cake - that looks amazing! Yay another amazing layer cake! I seriously love how crazy and tall your cakes are. This looks so yummy. Happy Birthday! happy birthday! I make my own birthday cake all the time (a bit sad but at least I know the cake will be something that I like). I would definitely love to have this cake for my birthday though. The layers are amazing! Gah, total cake deliciousness! Chocolate mousse is my favourite thing EVER so layered with cake would be birthday perfection. That looks totally perfect and amazing! Happy birthday! Look at all those layers!! Delicious! Gobsmacked, lol. :) Never heard that word before! 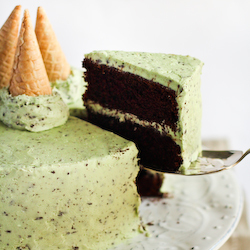 And this cake is soo not messy. It looks so perfect! Chocolate mousse icing sounds like the best thing! Maltesers have been my favorite candy for as long as I can remember. 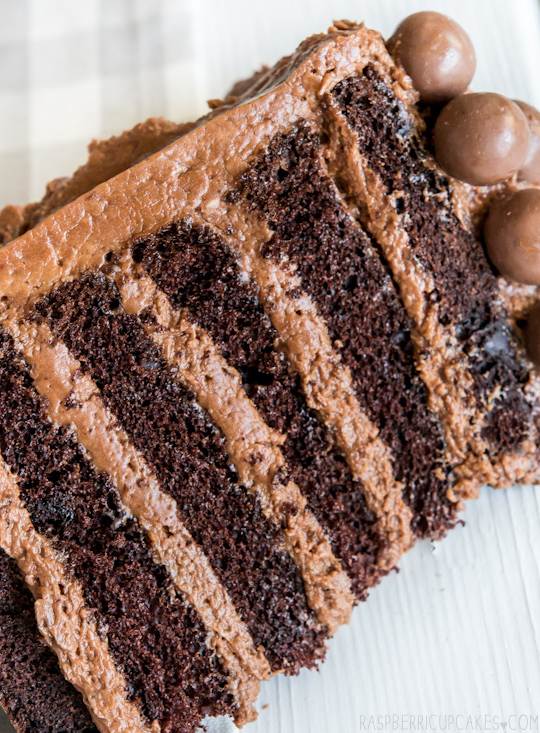 Mounding them on top of a chocolate cake sounds utterly dreamy. And I totally understand making your own birthday cake… I've done it. Happy birthday! YOu know what, you bake a cake for yourself for your birthday because you want the cake just perfect. Nobody else can bake something that good, unless it was the baker from your childhood memories at the mall!!! Gorgeous cake, the layers look amazing! I always go back to 1 Utama when I'm back in KL :) I used to love all the cakes from Secret recipe! That is simply a breathtaking cake - no wonder you didn't want to wait! Very wise of you. Congrats on your Cosmo award too - well deserved. Look at that cake, that is immense and fabulous. Bet it was just delicious! ...and no 6 layers is not going overboard at all!!! This looks beautiful and perfect! I'll have to make this for my birthday. Great work. There is no mistake, please read the recipe again carefully. "Place butter in a large mixing bowl and beat on high with an electric mixer until smooth and fluffy." Oh my God. 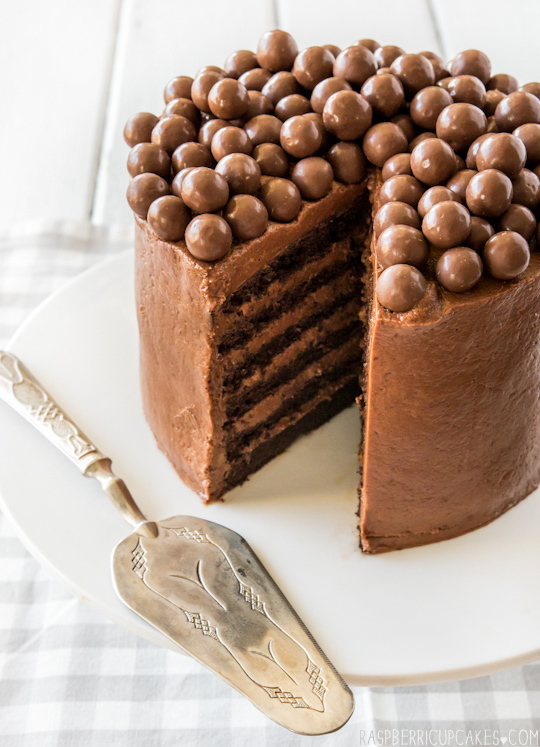 This looks amazing, and anything that incorporates a mountain of malteasers is definitely a winner in my book! This cake is amazing....btw, it was really helpful when you shared snaps of 'how-you-did-it' while sharing your recipe. Gives a small idea of how you went about making/baking your treat. Please continue to share those pics along with the beautifully presented ones. Just a suggestion. Thanks. Thanks for the feedback Manju, I'll keep it in mind. It was very difficult to shoot good quality method shots whilst baking, the light quality in my current kitchen is not great and my camera was getting gunky from handling the baking ingredients and the camera at the same time. Oh my GOODNESS!! This looks unreal. Absolutely dying to give it a try!! I spend my weekends waiting to see what you're gonna post on a Monday morning. Starts the week off very nicely!! so if you where looking for a actual review of making this instead of just "OMG SO SOSOSOSOSOSOS YUM YUM YUM" or whatever other dreck is above read on macduff. 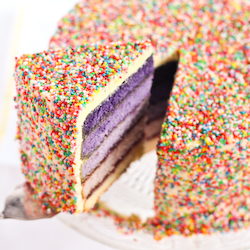 first off, worst sponge cake for layering EVER!!! 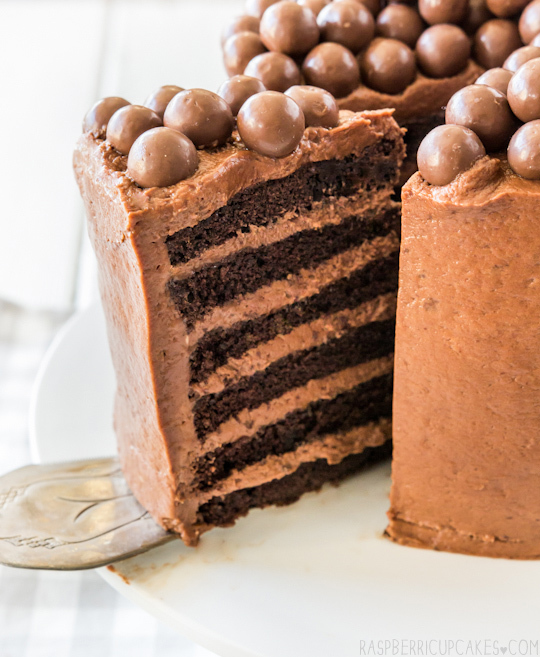 cant stress that enough that there are much better sponge or normal choclate cakes then this one. If your insistant on using this, use 2 less eggs and make them the day before and FREEZE THEM. The icing is the saving grace of this, seriesly if she used that actual cake recipe then this woman is amazing. I halved the icing recipe and had more then enough, also i would deffo recomend using the el-cheapo choc for this one the pure good quality stuff comes out a tad strong, i was using lindt 70% milk cooking choc and wow, still very strong bitter taste, so yep, skimp on the choc on this one and use the homebrand. ice and crumb coat at room temp when you first make the icing, then stick in the fridge for a good 10 mins or more and then add the final layer. 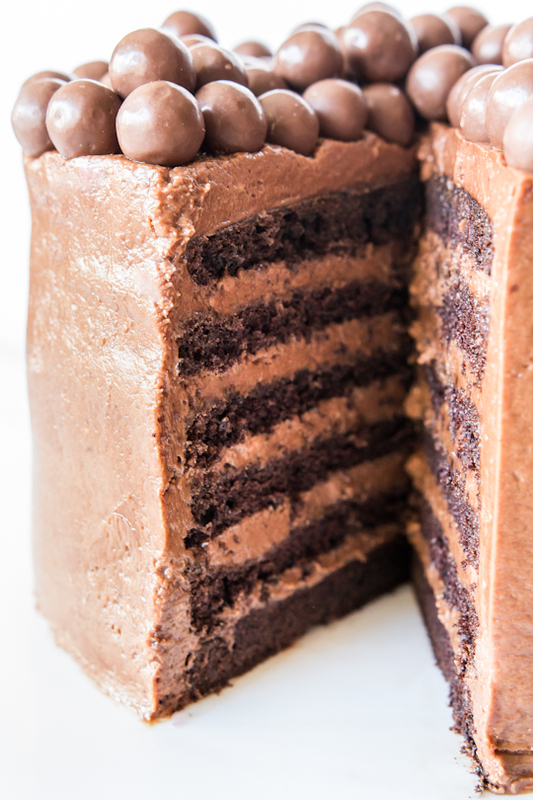 overall, if its your first layer cake, you will cry yourself to sleep. I'm sorry you had trouble with this recipe, I appreciate the feedback albeit fairly rude and posted anonymously with terrible grammar. Firstly, I did state that the cakes are very delicate so yes they are not the ideal layering cake. I never said they were. They were perfect for my purposes, as I mentioned I wanted a very light layered cake to go with the icing. There is nothing wrong with the recipe as a sponge cake, I have used it many times and it is from Gourmet Traveller. I did also do mention on my about me page that my recipes are not for beginners, and I agree this is definitely NOT a cake I would recommend as someone's first layered cake. I'll add a note to state this in the recipe. Lastly, of course your icing had a bitter taste, don't you realise what the 70% means? That means it is 70% cocoa, which is very bitter and technically classified as dark or bittersweet chocolate. I used Lindt Excellence extra creamy milk chocolate which has a much, much lower cocoa content. The bitterness has nothing to do with using high/low quality chocolate, you just used a high cocoa content chocolate. Some people prefer it, some don't. If I wanted to prepare this cake in stages, would it work to make the sponge ahead of time and freeze? Hi there! First of all, this cake looks delicious!! I do have a question. When you list "thickened cream", do you mean "heavy cream" or heavy cream that has already been whipped? I've seen this term used in another cookbook I have from the UK and I'm not sure I was thinking about the same product. Thanks! A quick google search would have answered your question. Yes, it is the same as heavy cream in terms of fat content, however there are thickening agents added to it to make it easier to whip and hold its shape. However using regular heavy cream should be fine too. Just letting you know I love your blog and all your wonderful creative cakes. I made this cake yesterday as a birthday surprise for a friend, well, I used your cake as inspiration but I made the cake that they used in the food dept website - I found that recipe to be more sturdy and a bit more moist and mud-cake like. And I think I could handle 4 layers, but probably not six like you. It turned out to be an absolute beast of a cake - I reckon it weighed about 3 kilos! But I took it to a party of about 20 people and it was a total hit - I couldn't believe almost all of it went, and I think practically everyone had seconds. 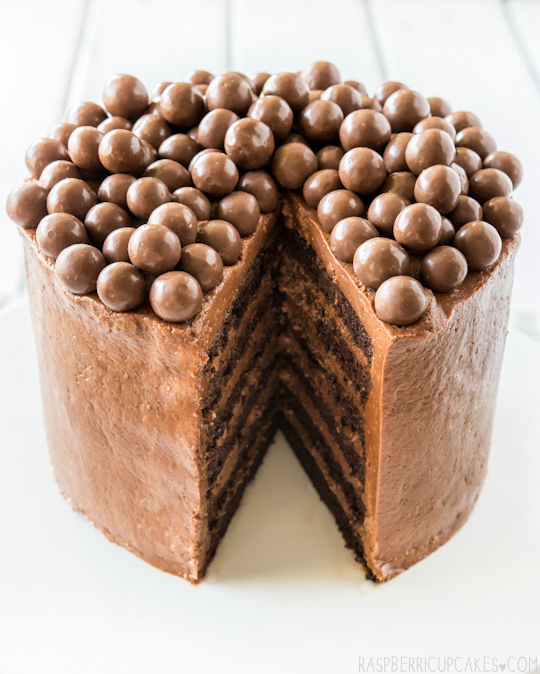 And it looked great with the maltesers on the top. But I wanted to write with my thoughts on the icing. The first batch I made split as well, but I actually warmed my cream up before and so there wasn't much difference in temperature. The second time I didn't do this, but put the cream in a bowl and kept it aside whilst I melted the chocolate and creamed the butter. The second time it was fine, no splitting. I had to make a third batch (I was using the food dept's recipe so I had half of your recipe) and this time there was a little milk separating, but it was still usable, and when I had iced it and put it in the fridge it went away. So, my theory is not the temperatures, because if you do it in this order - 1) pour cream and sugar in a bowl 2) melt chocolate and put aside 3) beat cream till there are soft peaks 4) cream butter 5) pour chocolate into butter and 6) fold cream in; there isn't really an issue with the temperature. I think the issue is in beating the cream too much. For the batch that really worked they were soft peaks, but for the first and third batches I beat the cream a bit more. For the first, which was the worst, I also beat the chocolate and cream in, but for the other two, I folded both the chocolate and cream in. So I think if you make sure you don't overbeat your cream then it seems to integrate better. I have only made it once, but thought I would share just in case it helps someone else. I am an Aussie living in the UK, so I probably have a cooler ambient temperature to work in than if I was making it in Oz, so I don't know if that would have an impact at all. Anyway, thanks again Steph for sharing with us your wonderful creations. It's meant to be exactly as the recipe states, 2 tbsp plain flour and 130g cornflour. Not sure where you got 220g from.